• Design and preparation of Manufacturing, Sub-station, Storage and Management areas. Installation of Sheet Extrusion Line A. • Installation of Thermoforming Line A for clamshells for fruit and vegetable packaging. • Installation of grinding plant for the recycling of industrial waste. - «PUNNET KAPA 40 LONG». • Installation of Thermoforming Line Β for clamshells for fruit and vegetable packaging. • Installation of second largest grinding plant for the recycling of industrial waste, following the increased activity of the plant. 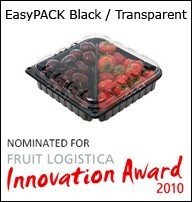 Design of new range of reinforced products under the brand “EASYPACK SQUARE”. Start of preparation of the installation area for the 2nd Production Line of multilayer (7) PET, PP and laminated PET-PE film and the Cutting and Winding Line for this film into smaller rolls for the foods industry. The installation of the new plant and the start of production in accordance with the company’s business plan is to be completed in November 2008. Start of production on a new range of reinforced products under the brand “EASYPACK SQUARE”. Installation of 1st and 2nd production lines for the application of PLURIBALL film on packaging of our own production. Extension to the 1st sheet production line with the aim of increasing productivity and the capability of producing duotone PET film in bands for the production of duotone “EASYPACK” packaging. Installation of 3rd and 4th Industrial Production Lines for the production of packaging (punnets) for fruit and vegetables.